I've spent several evenings over the years at the Brooklyn Brewery drinking with friends. The faint scent of malted barley gives the place a certain warmth that's always made it the perfect place to start a Friday or Saturday night in the area. Wednesday evening, that same aroma hung in the air, only this time I had come for more profound reasons. In place of large tables usually surrounded with Williamsburg hipsters, the room had been filled with rows of chairs facing a small stage. 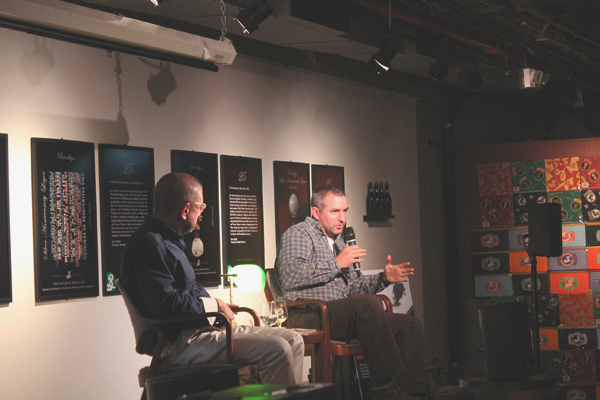 Everyone had come to hear Brooklyn Brewery Co-Founder and President, Steve Hindy, interview former Marine and War Correspondent, C.J. Chivers. Steve Hindy has a certain affinity for war correspondents. Before deciding to turn his home brewing hobby into professional craft, Steve was a Beirut-based Middle East correspondent for the Associated Press. Knowing the dangers that come with the profession, Hindy holds these interviews at the Brooklyn Brewery for the benefit of RISC. Through ticket sales, the organization receives funding to train journalists in life saving skills for use in the field, while the attendees of these events get a thought provoking evening, as they gain first-hand insight into a complicated world. C.J. Chivers was reporting near the World Trade Center on the morning of September 11, 2001. On the 12th anniversary of that fateful day, his account was a moving reminder of the innocence we lost that day. However, what I appreciated most from the evening was seeing how much of a human element Chivers gives to his perspective in the field. Rather than report through the eyes of an American, or even a Marine, he tries to write through a "human lens." He looks at these horrific situations and asks, "What would most mitigate human suffering and bring stability?" Unfortunately, when speaking on the current situation in Syria, the former Marine doesn't see "a good outcome [...] coming our way anytime soon." This isn't necessarily surprising. War is not black and white. Innocent lives are lost daily, and there's never a simple answer. After years in the field, Chivers knows this. What he wanted from the audience was for us to look at these situations through "human lenses." He wanted us to see that "combatants are people and have to be understood as human beings." On all sides, it's important to remember that we're dealing with folks just like the rest of us. Such a request may seem simple. However, in order to understand, "you have to share in [the] experience." Most of us aren't in Syria, Iraq, Afghanistan, Egypt, or any of the other numerous places riddled with animosity, nor do we have the desire to go. As such, we're fortunate to have journalists like Chivers willing to risk their lives, so that we can gain a understanding of the truth out there. The more informed we are, the more likely we are to know what role to play. Hopefully, informed decisions will result in less human suffering. By the end of the evening, I felt quite blessed to be able to hear Chivers' stories and ask questions while peacefully sipping a couple of craft beers. It certainly put things into perspective. I am very lucky to be living in a free country, as not everyone is as blessed. Without these journalists, I may not appreciate that reality at all. When asked what advice he had for aspiring writers, our speaker responded, "Just go do it. Have fun." He said that we should ask how we know something and then go find out. We owe it to ourselves to stay informed. A knowledgeable populace has more potential to serve humanity than those who stay ignorant. The answers we find may not always be simple but hopefully, we always have the consciousness to, like Chivers, ask the right questions. RISC is dedicated to promoting the safety of freelance journalists in combat zone. RISC trains and equips freelance journalists in all media to treat life-threatening injuries on the battlefield. Freelancers comprise the vast majority of those who cover wars, and consequently make up the vast majority of deaths and injuries. Surviving a gunshot or shrapnel wound is often a matter of doing the right thing in the first few minutes, and our training focuses on that brief, critical period of time. It is our hope to make first aid training the industry norm - like having a flak jacket or sat phone - and to prevent unnecessary deaths in a job that is so vital to human dignity and human rights. RISC trainings are provided free of cost to experienced, published freelance conflict journalists. While staff reporters are often provided training by their employers, freelancers have to pay thousands of dollars out of pocket to participate in traditional hostile environment courses – and most simply cannot afford to. Please consider making a donation to help RISC train more independent journalists around the world. Connect via Facebook and Twitter.